Nearly 500 species of Passalidae have been described, mainly in the new world tropics (Arnett et al. 2002). The family Passalidae, commonly known as bess bugs or patent leather beetles, is a member of the superfamily Scarabaeoidea, and has only a few occurring species within the United States (Schuster 1983). 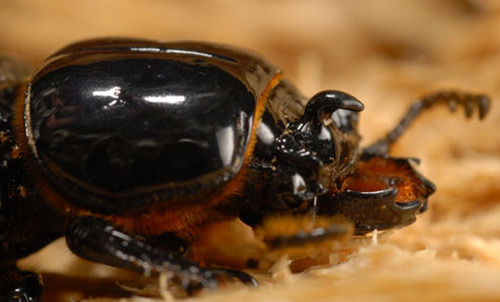 The horned passalus or betsy beetle, Odontotaenius disjunctus (Illiger), is a widely distributed, easily recognizable beetle and is the most commonly encountered beetle of Passalidae in the United States, due to its relative monopoly in the North American geography. Previously, Passalus punctiger (Lepeletier) and Passalus punctatostriatus (Percheron) have been reported as exotic species in the United States, but recent records do not indicate a current population of either species (Schuster 1983). 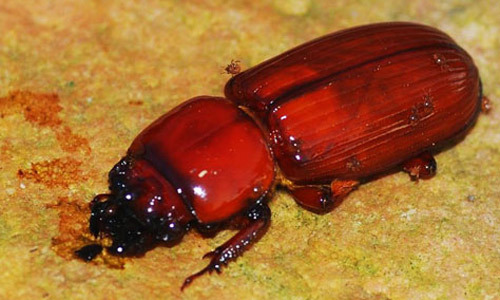 Species within the family Passalidae, including the horned passalus, are beneficial decomposers of wood. The horned passalus only decomposes decaying wood or logs, and it is not a pest of urban structures. Figure 1. Lateral view of a horned passalus, Odontotaenius disjunctus Illiger. 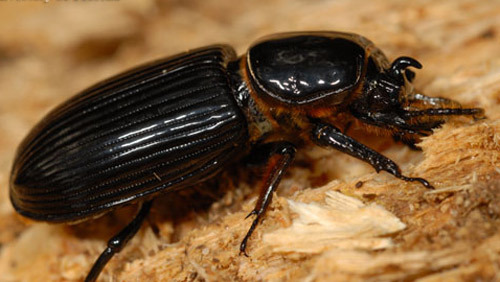 The shiny black color was responsible for another commonly used name: patent leather beetle. Photograph by Lyle J. Buss, University of Florida. Odontotaenius floridanus Schuster, a beetle of close ancestry to O. disjunctus, occurs endemically in a limited area in Florida. Odontotaenius floridanus resembles O. disjunctus in most aspects of the life cycle and morphology except for having wider front tibiae and a reduced horn (Schuster 1994). Few members of Passalidae are established in the United States, and only the two species mentioned previously are believed not to have migrated or been introduced from Central America (Schuster 1983). Odontotaenius disjunctus has also been formerly known as Popilius disjunctus (Illiger) and Passalus cornutus (Fabricius) (Hincks 1951). 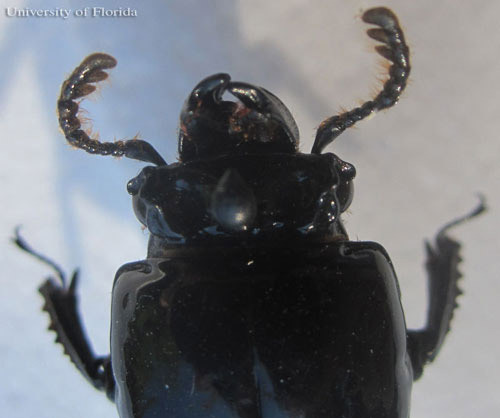 Horned passalus is the approved Entomological Society of America common name, but the following common names are often also associated with it: betsy beetle, bess bug, patent leather beetle, Jerusalem beetle, horn beetle, and peg beetle. Some of these common names apply specifically to O. disjunctus, and others may generally refer to the family Passalidae. The horned passalus occurs in a wide range from mid-Florida to Massachusetts, Southern Texas to Minnesota, and Nebraska (Schuster 1983). More recent sources indicate further expansion from eastern Texas, throughout the eastern United States, and from southern Manitoba through the Canadian deciduous forests, and southern Ontario (Arnett et al. 2002). Figure 2. United State's distribution of the horned passalus, Odontotaenius disjunctus Illiger. (Map was extrapolated using literature sources Schuster 1983 and Arnett et al. 2002). Programmed by Mike Boone; Christopher S. Bibbs, University of Florida. 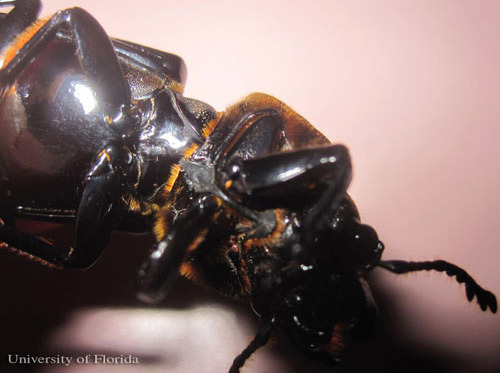 Adults: Horned passalus adults are relatively large, dark glossy black beetles, with adult size typically ranging from 30–40 mm (1.2 inch–1.6 inch). Golden hairs can be seen lining the middle pair of legs, pronotum, and antennae. These hairs are detectable by the naked eye. Figure 3. Golden hair fringes on a horned passalus, Odontotaenius disjunctus Illiger. Photograph by Christopher S. Bibbs, University of Florida. The elytra, or hardened outer forewing, are characterized by deep grooves. The horned passalus also has a groove down the midline of the pronotum. Figure 4. Dorsal view of an adult horned passalus, Odontotaenius disjunctus Illiger. Photograph by Lyle J. Buss, University of Florida. Antennae have 10 segments, with the distal three segments forming a lamellate club. This is an easily identifiable characteristic of the family. Figure 5. Close up of lanellate antennae, a characteristic of the horned passalus, Odontotaenius disjunctus Illiger. Photograph by Christopher S. Bibbs, University of Florida. A single, curved horn points forward on top of the head and between the eyes. 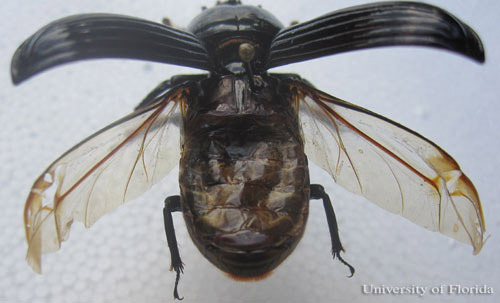 Adults of the horned passalus additionally have thick, robust mandibles that clearly are also visible. Figure 6. Close up of the head and curved horn of the horned passalus, Odontotaenius disjunctus Illiger. Also notice the fringes of golden hairs and the mites just behind the head. Photograph by Lyle J. Buss, University of Florida. On average, adults live up to a year. A key characteristic of horned passalus adults is the acoustical signals (stridulation) they emit when disturbed or agitated. Eggs: The eggs of the horned passalus are exceptionally large, measuring at 3.0 by 2.4 mm (approximately 0.1 inch) when first laid and reaching 3.7 by 3.2 mm just before hatching. The size of the eggs makes them easy to manipulate in the large mandibles of the adults. Eggs are typically found in groups surrounded by frass from the adults. Larvae: The larvae are large, white grubs that have up to three instars. 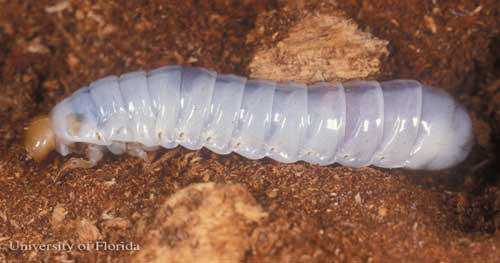 Larvae are found in the same galleries as the adults. To obtain nutrients, the larvae feed on predigested wood from the adults. Figure 7. Larva of the horned passalus, Odontotaenius disjunctus Illiger, posed to see body shape. Photograph by Lyle J. Buss, University of Florida. Figure 8. Larva of the horned passalus, Odontotaenius disjunctus Illiger, with close up of head capsule. Photograph by Lyle J.Buss, University of Florida. Figure 9. Larva of the horned passalus, Odontotaenius disjunctus Illiger, with close up of legs. Photograph by Lyle J.Buss, University of Florida. 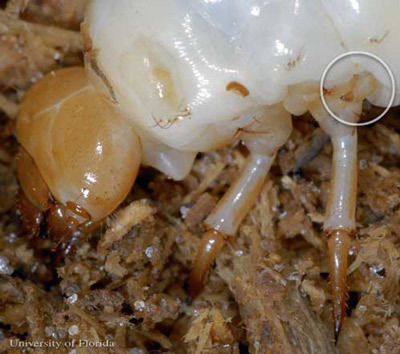 Grubs appear to only have two pairs of legs, but a third pair is present and reduced. Only the first two pairs are used for locomotion. As is typical for beetles within the superfamily Scarabaeoidae, grubs retain a characteristic C-shaped posture when not active. The larvae have no active defenses except for well proportioned mandibles, and auditory signals similiar to those used by adult beetles. Pupae: As pupae begin to form, they become pearly white with a rainbow sheen. 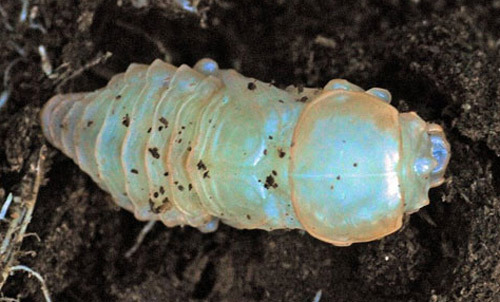 As the pupae age, they lose their rainbow sheen and can range in color from off white to earth-toned. Pupae that are nearing emergence become translucent. Pupation times vary based on climatic conditions. Figure 10. Pupa of the horned passalus, Odontotaenius disjunctus Illiger. Photograph by Shelly Cox, Missouri Department of Conservation. Using its large mandibles, the horned passalus cuts into fallen logs and creates galleries where it lives and breeds. Figure 11. Deeply carved wood tunnels of the horned passalus, Odontotaenius disjunctus Illiger. (University of Florida educational specimens). Photograph by Christopher S. Bibbs, University of Florida. Adults aggregate and compete for sections of fallen wood, provided the wood is large enough to support more than the initial inhabitants of the wood. Figure 12. Aggregation of the horned passalus, Odontotaenius disjunctus Illiger, in the same wood pieces. (University of Florida educational specimens). Photograph by Christopher S. Bibbs, University of Florida. Parents of new egg clutches will create a subsocial relationship where adults of both sexes tend the larva throughout the gallery complex in cooperative care of brood (Schuster and Schuster 1985). If the wood remains undisturbed, more than one generation will cohabitate the same log and young adults will also participate in sibling and new brood care. Adults are territorial and protect their galleries from intruders, but both adults and larvae will cannibalize injured immatures (King and Fashing 2007). Mites can commonly be found on the exoskeleton of the horned passalus. These mites are diverse, but not harmful to humans or the beetle. 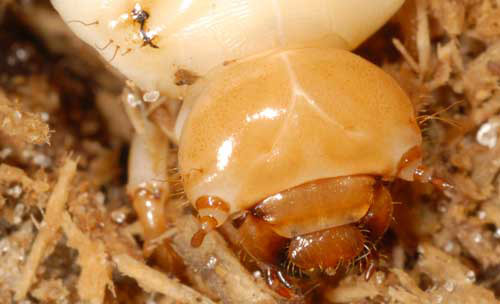 Once eggs have been laid, adults move clutches of eggs through their galleries repeatedly. Searching for the best areas of wood for larvae to settle, parents of the eggs will attempt to find and guard ideal feeding sites for the protection and transportation of their eggs (Wicknick and Miskelly 2009). Once eggs hatch, larvae remain with the parent adults and share mixtures of frass and softened wood. Depending upon temperature and moisture conditions, the entire life cycle may occur within a summer season or take as long as 14–16 months (Kraus and Ryan 1953). Prior to pupation, adults will pack the pupal chamber cells within the decayed wood with detritus and remnants. These pupal cells disguise the vulnerable stage within, but the full purpose of these cells has not been proven (Valenzuela-Gonzalez 1992). Adults of all ages, including young newly emerged adults have the ability to create these pupal cells. The quality of the cells varies with the age of the adult. Should these detritus cells around the pupae become damaged, adults will repair them. Pupae are capable of overwintering if the additional time is necessary for full development. 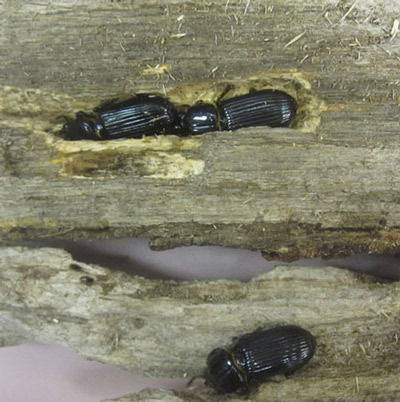 While some logs may maintain multiple generations of beetle, young adults typically stay within the parent log for a minimal period of time. Overlapping generations of beetles within the same host structure will only remain as long as it takes them to fully mature. These young adults lack the characteristic black shell of the species, and instead have a red coloration when they emerge from the pupal stage. This red color slowly darkens to black, at which point the insect is considered a mature adult (Schuster and Schuster 1985). Figure 13. Freshly emerged teneral adult horned passalus, Odontotaenius disjunctus Illiger, already inhabited by mites (crawling on elytra). Photograph by Shelly Cox, Missouri Department of Conservation. This newly mature adult will leave the parent log and participate in a nuptial flight, one of the only instances of their wing use (MacGown and MacGown 1996). During observations of the nuptial flight, adults were found to be susceptible to light attractants such as light traps and street lights. At the end of the nuptial flight adults will seek out a new log to start another aggregation. The gentle nature of the horned passalus and its reluctance to fly has contributed to its adoption as a safe and easy-to-handle creature for live specimen demonstrations and outreach education by universities. Domestically, it is low maintenance in care and only requires consistent supplies of moistened wood which can be obtained in any natural area that is normally suitable for the beetle. The horned passalus prefers hardwoods, such as oak (Quercus spp.) or elm (Ulmus spp. ), and will only reside in a log that has fallen and begun to decay. Optimal conditions include high moisture levels, as the beetles are sensitive to dry conditions. 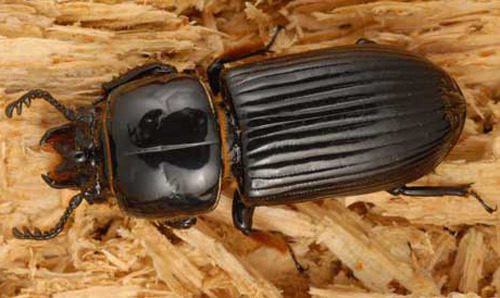 For the beetles to digest the wood, the wood must also have microflora, such as naturally occurring fungi and bacteria, which are breaking down the wood. These microflora aid in the predigestion of the wood. In plant feeding insects, undigested remains are expelled in the form of a fine powdery material, called frass. When the horned passalus takes up residence in a log, the beetles facilitate log decomposition by chewing up wood pulp and expelling frass. Fungi and bacteria then target frass for their own nutrient extraction (Arnett et al. 2002). Once the frass has been sufficiently reprocessed by the fungi and bacteria, the horned passalus then consumes the frass and wood again for successful digestion. Logs that have been inhabited by the horned passalus tend to have sawdust littered around and beneath the log. Several members of the family Passalidae have the ability to stridulate. Other groups of insects have also developed this capacity, including but not limited to various species of crickets, katydids, grasshoppers, ants and cicadas. Insect stridulation is the emission of sounds by creating friction between two body segments or limbs. Stridulation can be simply demonstrated by taking a plastic comb and scraping the edge of your nail down the row of comb teeth. Stridulation is common as a form of communication within a species, similar in specificity to pheromones and photic signals in insects. In the horned passalus both adults and larvae have the ability to create clearly audible sounds using stridulation. The horned passalus specifically has 17 discovered sound signals among adults and larvae, all of which are for communication within their complex subsocial aggregations including for defense, group communication, and management of immature beetles (Schuster 1975). As expressed by Reyes-Castillo and Jarman (1980), this repertoire "represents the most elaborate system of sound communication known for any arthropod." Adults create auditory signals using an adapted abdomen and wing structure. The non-hardened hind wings, which are kept folded beneath the protective elytra, have many rows of small spines on the underside. On the abdominal segments beneath these spined areas of the hind wings is a toughened region called pars stridens. This structure is not identifiable to the unaided eye. Figure 14. Elytra raised, exposing the dorsal throax and abdomen of a pinned and dried horned passalus, Odontotaenius disjunctus Illiger. Photograph by Christopher S. Bibbs, University of Florida. 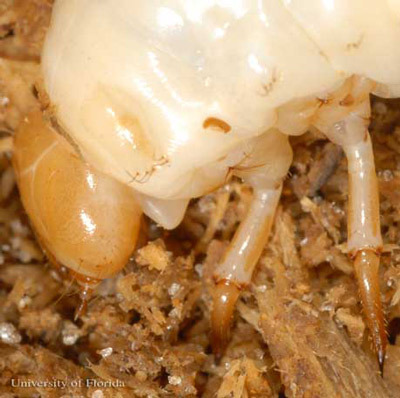 To create sound, the spines are scraped across this textured area of the abdomen. Different frequencies of noise can be generated depending on the speed and pattern of the movement (Reyes-Castillo and Jarman 1983). In immature horned passalus, the third pair of legs is actually reduced in order to aid stridulation. The middle pair of legs has pars stridens (a set of ridges) on the proximal end of the leg. The third pair of legs, with its reduced radial movement, is able to reach the pars stridens with its apex and create the friction necessary to generate noise. The larval auditory signals are equivocal in volume to the adult signal. Figure 15. Close up of one of the reduced third pair of legs in a larvae of the horned passalus, Odontotaenius disjunctus Illiger. Photograph by Lyle J.Buss, University of Florida. The tips of these reduced legs have multiple teeth close to the apex of the leg point. These various teeth are used at different angles to create the different frequencies necessary to communicate between larvae, parent adults, and non-parent adults. The stridulations of the horned passalus show evidence that even outside of the protective logs, they serve defensive purposes. The larvae and fully developed beetles have few defenses against predators. However, their readiness to sound off when disturbed contributes to their survival. Click here to listen to an audio file of the defensive sounds emitted by Odontotaenius disjunctus. In experiments testing the importance of their sound making as a defense, larvae of the horned passalus were intentionally exposed to crows to observe predation. The length of time until mortality was much greater among larvae that actively emitted sounds (Buchler et al. 1981). Arnett Jr RH, Thomas MC, Skelley PE, Frank JH. (editors) 2002. American Beetles, Volume II: Polyphaga: Scarabaeoidea through Curculionoidea. pp. 861. CRC Press, Boca Raton, FL. Buchler ER, Wright TB, Brown ED. 1981. On the functions of stridulation by the passalid beetle Odontotaenius disjunctus (Coleoptera: Passalidae). Animal Behaviour 29: 483-486. Hincks WD. 1951. A note on "Passalus cornutus Fabricius" (Passalidae). The Coleopterists Bulletin 5: 12-13. King A, Fashing N. 2007. Infanticidal behavior in the subsocial beetle Odontotaenius disjunctus (Illiger) (Coleoptera: Passalidae). Journal of Insect Behavior 20: 527-536. Kraus JB, Ryan MT. 1953. The stages of development in the embryology of the horned passalus beetle, Popilius disjunctus (Illiger). Annals of the Entomological Society of America 46: 1-20. MacGown JA, MacGown MJ. 1996. Observation of a nuptial flight of the horned passalus beetle, Odontotaenius disjunctus (Illiger) (Coleoptera: Passalidae). The Coleopterists Bulletin 50: 201-203. Reyes-Castillo P, Jarman M. 1983. Disturbance sounds of adult passalid beetles (Coleoptera: Passalidae): structural and functional aspects. Annals of the Entomological Society of America 76: 6-22. Reyes-Castillo P, Jarman M. 1980. Some notes on larval stridulation in neotropical Passalidae (Coleoptera: Lamellicornia). The Coleopterists Bulletin 34: 263-270. Schuster JC. 1994. Odontotaenius floridanus new species (Coleoptera: Passalidae): a second U.S. passalid beetle. Florida Entomologist 77: 474-479. Schuster JC. 1983. The Passalidae of the United States. The Coleopterists Bulletin 37: 302-305. Schuster JC. 1975. Comparative Behaviour, Acoustical Signals, and Ecology of New World Passalidae (Coleoptera). 127 pages. PhD Thesis. University of Florida, Gainesville, FL. Schuster JC, Schuster LB. 1985. Social behavior in passalid beetles (Coleoptera: Passalidae): cooperative broode care. Florida Entomologist 68: 266-272. Valenzuela-Gonzalez JV. 1992. Pupal cell-building behavior in passalid beetles (Coleopter: Passalidae). Journal of Insect Behavior 6: 33-41. Wicknick JA, Miskelly SA. 2009. Behavioral interactions between non-cohabitating bess beetles, Odontotaenius disjunctus (Illiger) (Coleoptera: Passalidae). The Coleopterists Bulletin 63: 108-116.